Taking security across APAC: are your loans secure? 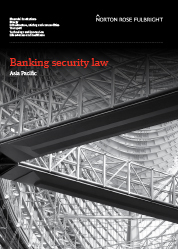 In collaboration with DFDL, Norton Rose Fulbright has launched an interactive guide on banking security laws covering the Asia-Pacific region. Included in this guide you will find analysis and local knowledge of this topic as provided by our teams in DFDL Cambodia and the Lao PDR, along with the effect that the new laws will exert on these jurisdictions. By clicking on the download button you can register to access the interactive guide. This will then redirect you to the Norton Rose Fulbright interactive guide.